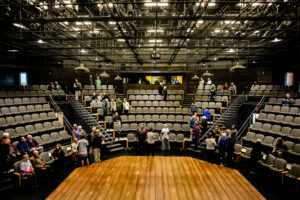 Three years ago, this month, Northern Stage’s new home, the Barrette Center for the Arts, opened in White River Junction, VT. Housed within Barrette Center is the intimate Jack & Dorothy Byrne Theater. The Byrne is a beautiful, intimate 240-seat modified thrust space featuring a steep seating rake (there is not a bad seat in that house!) and industrial “factory” theming throughout the building. I had to look into Mills’ next statement, “Another great part of the grid system is the moveable I-beams. We use the I-beams for every show, allowing us to rig items [through] the grid where otherwise there is nothing above the stage.” What now? 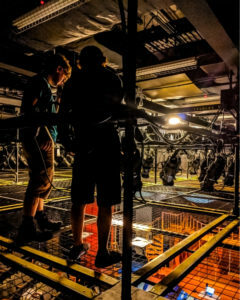 The moveable I-beams Miller is referring to are actually a super-cool accessory specified by Theatre Projects Consultants for venues with SkyDecks. These are demountable (moveable) aluminum lift bars that are made to go between a facility’s existing steel beams and they do exactly what Miller says: provide additional rigging points practically anywhere above the stage. They work beautifully with SkyDeck’s gridwells – the open spaces you see between the grid panels – pictured on the right.